Lately it seems that task cards are everywhere! 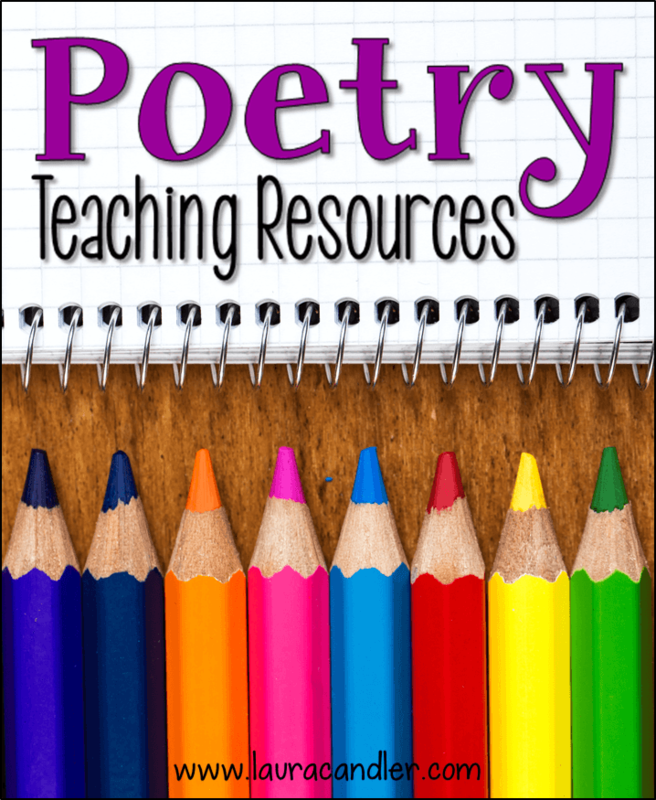 If you don’t believe me, search for teaching resources on virtually any topic, and count the number of task card sets that pop up in your results! If you’re new to task cards, you might not realize that they’ve actually been around for many years. Back in the day, task cards didn’t look as cute as the current Pinterest-worthy creations. 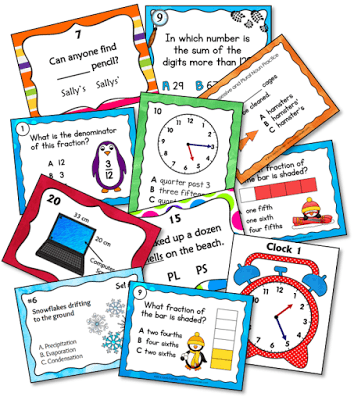 However, no matter what they look like, task cards are really nothing more than worksheets in a fun format! Because the academic content has been divided into manageable chunks, task cards seem less intimidating than a paper-and-pencil assignment. This handy format makes task cards perfect for partner work and team work because they help kids focus on one problem or one question at a time. Years ago, I created task cards by writing questions or math problems on index cards. But that method was too time-consuming when preparing enough for each team to have a set. To make the process easier, I created a blank template with 6 or 8 empty boxes and I wrote or typed the questions directly onto the page. Then I printed one copy per team and cut the cards apart with a paper cutter. Those task cards weren’t pretty, but they worked! Times have certainly changed! Task cards evolved into a whole new genre of teaching resources, and they’re everywhere. I love creating them, and my recent task cards are quite a bit different from my early creations! 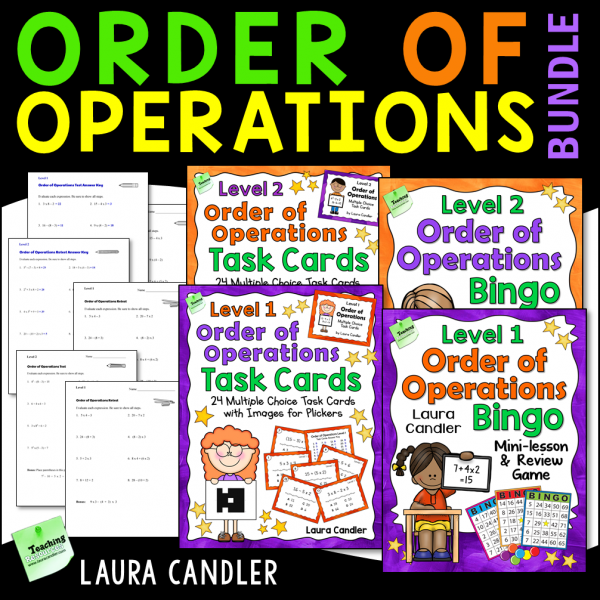 From short answer task cards, to multiple choice cards, to performance-based task cards, and discussion cards… there’s no need for you to create your own when there are this many ready-to-use options. Life’s too short to be constantly reinventing the wheel. Ultimately, it really doesn’t matter if your task cards are plain and simple or if they’re colorful and cute. What DOES matter is how you use them. Task cards are fine for independent practice, but if you want to boost achievement, kids need to engage in productive talk when using task cards. The 6 cooperative learning strategies below are some of my favorites when it comes to fostering meaningful task card talk. Unfortunately, there’s no way I can write out step-by-step directions for each of these strategies in a single blog post. Fortunately, I don’t have to write full directions because I’ll have the opportunity to share these strategies (and more) in my next live webinar! More about the webinar in a moment, but first let me share a little about each of these “task card talk” strategies. Students work with a partner to solve problems or answer questions on task cards. They compare and discuss their answers after each card. Students mix around the room and stop when the teacher says, “Freeze.” Next, students find a partner and pair up. Then the teacher displays a task card and students work with their partners to solve the problem or answer the question. After a short class discussion about the answer, the students begin moving and the steps are repeated. Showdown is a team strategy similar to Pairs Solve & Compare. Task cards are placed in the middle of the team and the Leader flips over the top card. Everyone solves the problem or answers the question on a dry erase board and flips the board face down. When everyone is ready, the Leader says, “Showdown!” and students show, compare, and discuss their responses. Have you heard of Scoot? It’s a game for the whole class in which a task card is placed on each desk, and students “scoot” from desk to desk to solve the problems. Team Scoot is the cooperative learning variation of this activity, and it’s more effective (and more fun) because kids have the opportunity to discuss their answers and get help. Share Around is a simple strategy to ensure equal participation during a team discussion. Students take turns around the team reading and answering questions on task cards. Talking Sticks is a more advanced team discussion strategy. Each team member takes the same number of craft sticks (usually 2 or 3) from a cup held by the leader. The leader reads a task card question aloud, and students who want to respond hold up a stick. The leader calls on a student who places his or her stick in the cup and answers the question. If a student runs out of sticks, he or she may not talk until all team members have used their sticks. Talking Sticks in shown in action in this photo I took several years ago. 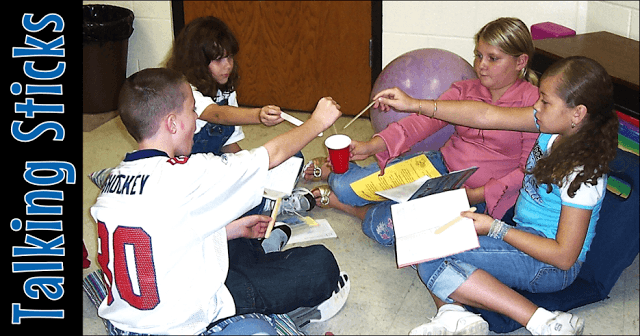 I really didn’t do justice to these cooperative learning strategies in this post. There’s so much more to share about how to implement them to maximize learning. That’s one reason I was excited to dive into these strategies in a recent webinar I co-presented with Rachel Lynette of Minds in Bloom. Being able to describe them verbally in Power Up Learning with Task Cards gave me the opportunity to share step-by-step directions and classroom management techniques that will make these strategies work in your classroom. I was thrilled to be able to collaborate with Rachel on this project because task cards are her specialty. We planned the webinar for weeks, and we had the best time presenting it! 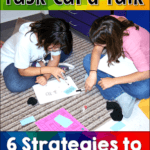 We shared over a dozen strategies for using task cards, including how to differentiate instruction, key questions to ask when planning task card lessons, and how to use task cards for assessment. For a peek at what we covered, download the Webinar Notes packet shown here. You can tell that it was a jam-packed session, and you won’t be surprised to learn that it lasted almost 2 hours! 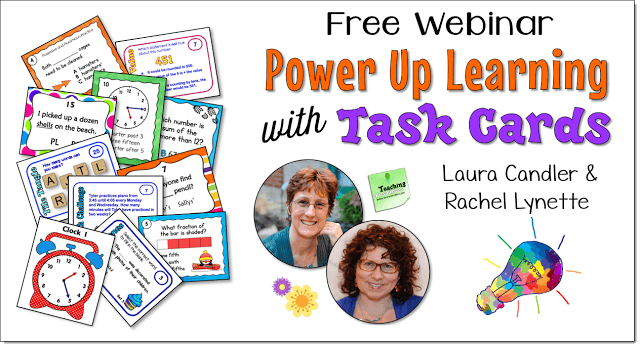 Watch the Task Cards Webinar Replay for Free! The webinar was a free live presentation, but the good news if you missed it is that you can watch a presentation of the replay for free! 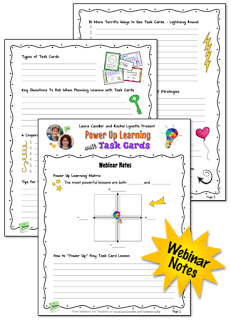 Click over to Power Up Learning with Task Cards and check it out! 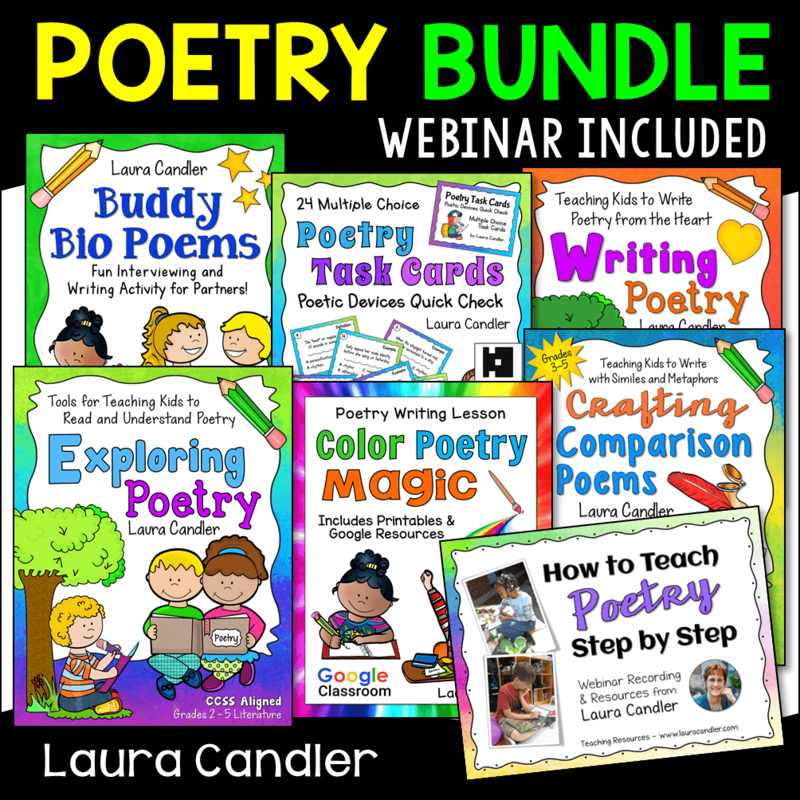 If you’re interested in obtaining a professional development certificate for the webinar, you can purchase the webinar pack from my TpT store. 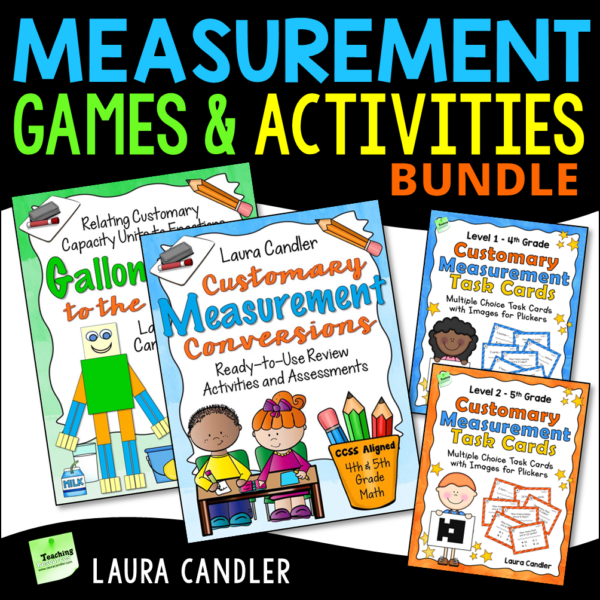 That certificate is also included in two of my bundles: Interactive Teaching Made Easy Webinars and Power Up Task Cards. If you’d like to read what teachers who attended the session thought about Power Up Learning with Task Cards, check out these Facebook comments that were posted after the session ended. Rachel and I were thrilled to know that our hard work paid off in such a big way!